All testing is performed with a Maha MH-C9000 WizardOne Charger-Analyzer (sic) – possibly the first, er, first and second one in New Zealand. No, correct that, testing will be done with my third MH-C9000... no, scrub that as well. Testing will be done with my fourth MH-C9000 (the first with batch number 0H0AA that I've seen reported). In theory, the MH-C9000 is excellent. In practice, however, I had a few issues with it (see Issues below). It has four independant channels for AA or AAA cells. For simple use, all that needs to be done is to place a battery in a slot and after a few seconds the device will start to charge automatically. 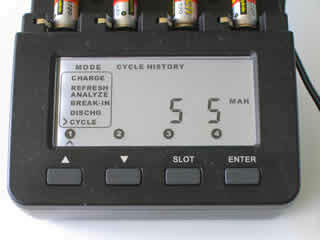 But the real use of the MH-C9000 is its ability to analyse the capacity of rechargeable cells. All sorts of NiMH and NiCd cell analyses can be done at a variety of charge and discharge rates, with each channel set separately so each cell can be doing its own thing in its own time. The charge rate for each channel can be set from 200 mA to 2000 mA, the discharge rate 100 mA to 1000mA, both in 100 mA steps. There are not many chargers that can manage 2000 mA on four channels. Battery capacity and other information is displayed at the end of an analysis run. One mode will run for up to 12 cycles and tell you the capacity for each cycle at the end of it all (yes, it takes a while). 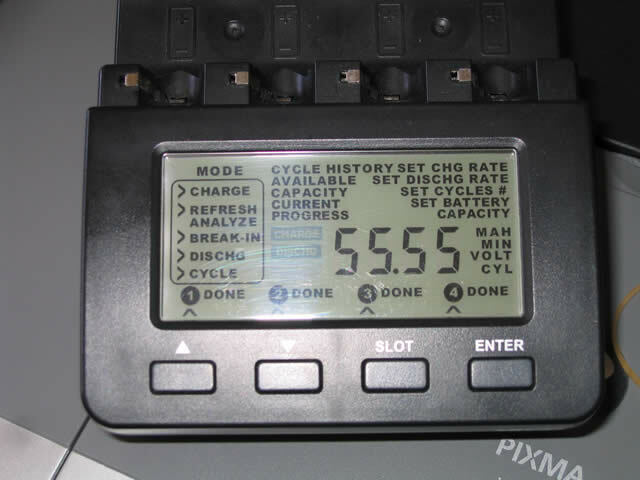 The power supply accepts international voltages and the charger can be run directly from 12V. All very nice. With the first firmware update (batch numbers 0G0B01 onward) the MH-C9000 makes a good everyday charger, and more recent versions (batch numbers 0G0E01 onward) have no firmware issues for those who want to make use of all its features. Many people may not want the capacity analysis functions. There are less expensive chargers which still charge well without the extra features. With that out of the way, for people who do want to see exactly how much capacity their batteries really have, the MH-C9000 is the best analyser I'm aware of in the price range and is definitely worthwhile compared to cheaper analyser alternatives. (Review. Comparison.) 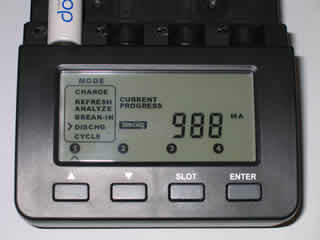 If you want to analyse your batteries, the MH-C9000 is fantastic. See the Shopping for Chargers page for places to buy. Unfortunately, I had a bad run with reliability. Shortly after I received my first MH-C9000, it went into an endless restart loop unless a cell was placed in slot 2. While measuring the supply voltage to see if there was a problem there I found the unit not restarting but instead charging slot 2 even though there was nothing in it. To get a replacement I made use of Maha Energy's impressive 3 year warranty, and they sent the replacement promptly. Excellent service. However, the second unit had the same firmware as the first. Due to serious termination issues with AAA cells (which I came to call Termination Roasting) and a strange display of the measured capacity on the cycle mode (which came to be called the repeating digit problem), a while later Maha sent me a third unit with updated firmware. Units with numbers 0FAB01* and 0FAB02 have the original firmware, while 0G0B01 has the new firmware, which fixes the original's termination issues very nicely. I'm told it terminates earlier than the old firmware, but then applies a two hour charge at 200 mA, then trickle charging, whereas the old firmware went straight to trickle charging after termination. The new firmware also discharges down to 0.90 volts under load instead of the original's 1.00 volts unloaded. When discharging the MH-C9000 now maintains the selected (or programmed) discharge current, whereas the old version tailed off the current as the cell voltage dropped. All these are very desirable improvements, and make the 0F units look like they were released before the product was quite ready. (Robert's Photograph Blog corroborates this with a rumour they mention in an update to their MH-C9000 review that the first firmware versions were quietly recalled from retailers.) However, a problem with repeating digits in Cycle mode made it through the firmware update, and was eventually fixed with the 0G0E01 batch. * Presumably the first two characters are the year – 0F means 2006, 0G is 2007, 0H is 2008, and so on. The next two characters are the month – 0B is 02 or February, 0I is 09 or September, AB is 12 or December, although more recently a 0K – "011" or November – has also been reported. The last two numbers, or more recently single letter, appear to be the batch number from that month. My own 0G0B01 unit, sadly, developed a couple of other problems in addition to its repeating digit issue. The first was that slot 1 would discharge at a higher rate than it should. The other problem was that parts of the screen started fading. Instead of being a solid black colour, the CHARGE, DISCHG and REST icons were fading out, the REST icon most of all. This was all a bit discouraging, and didn't instill confidence in the reliability of the thing, but eventually I heard that the repeating digit problem had been solved, so I emailed Maha Energy and they very nicely (honouring their impressive three year warranty once again) sent me a fourth MH-C9000. It's marked 0H0AA, has a much brighter screen than the previous versions I've seen – older ones look dim and dingy in comparison. I hope this unit is a bit more reliable than the others, but at least I've seen first hand that Maha firmly stands behind their impressive three year warranty. It's quite repeatable (on the affected units), and easy to produce – what more could one ask for in a firmware flaw? 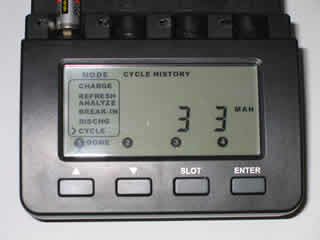 Put a battery in slot 1 and use the Cycle mode (at any charge/discharge rates) for 2 or more cycles. After the first discharge cycle the actual capacity will be displayed during the rest. (Make a note of it if you're doing this test yourself.) After the rest the MH-C9000 writes the capacity to the first cycle memory, which is accessible by pushing the up or down arrows. Unfortunately, on the first cycle (and only the first cycle) the capacity is written with the first two digits of the capacity repeated. I've managed to produce " 3 3", " 4 4", " 5 5", "1111", "1212" and "1313" by using different charging and discharging rates (on AAA cells and one old AA cell). Other testers have achieved "1515" from an actual capacity of 1568mAh, and "2525" from a 2573mAh cell (measured on a separate run). Because this problem only shows itself on the first cycle of slot 1, and because it's not particularly valuable information for many people, this problem isn't really a significant concern for most users. For others, however, it's very annoying not to be able to see how a cell's capacity is changing over several cycles. Another improvement with the new version is to the screen. The old version is on the left, new on the right. Note the black stripe at the left edge of the screen on the old version. Updated firmware – different charge/discharge settings, so lower capacity not significant. This was a problem with my third MH-C9000, where the discharge current on slot 1 was higher than it should be. The largest difference was at the highest discharge rate of 1000 mA, while at the lowest, 100 mA, it was about what it should be. It appeared to be a heat-related malfunctioning component in my particular charger for that slot. I've heard of just one other owner who experienced the same thing with his old firmware model in a different slot. Discharge rate set to 1000mA. Discharge rate set to 900mA. Over the first few minutes of a discharge the discharge current started at what it should be and slowly rose. With the 1000 mA setting it got to 1181 mA, 18% over what it should have been, while the 900 mA setting got to 988 mA, almost 10% over. In the (very roughly) second half of the discharge, as the cell flattens, the discharge current slowly drops toward the nominal value. When the 900 mA discharge run was reading 987 mA I blew into the top of the charger, cooling the electronics and resulting in a quick drop to 957 mA, then over the next couple of minutes or so it slowly rose again to 984 mA – a clear indication of a heat-related problem. The other slots did not have this problem, and were almost always within 1-2% of the nominal current. The screen on the MH-C9000 has a narrow vertical viewing angle, but occasionally owners have reported parts of the screen fading away. I had that happen with my third unit, with three icons being affected after about three quarters of a year of ownership. The CHARGE and DISCHG symbols are partly faded, but the REST label is almost completely faded and was very hard to see from any angle. I'll repeat that Maha firmly stands behind their impressive three year warranty. Since my last replacement I've had no further problems with it, and it has charged and analysed many batteries. 21 November 2017 – I've finished testing five sets of 3rd generation Eneloop cells and done a bit of analysis on the readings the MH-C9000 gave for the four slots. 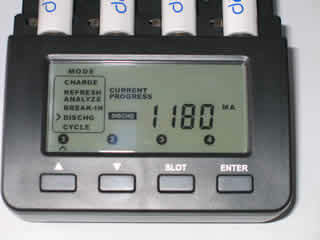 After the first break in charges the discharge capacities are consistently greatest in slot 1, followed by slot 2, then slot 3, and lowest in slot 4. Slots 3 and 4 have the greatest standard deviation. In all cases the standard deviation is well under 1% of the measured capacities. I think this means it's probably OK (and 5 cells per slot isn't much to draw a conclusion on). A few battery shootouts are mentioned on the More Info & Links page.